Smoky cheese, potato, and ham soup is an easy recipe that is made in your Dutch oven. You can proudly serve this St. Patrick's Day comfort food to your family for lunch or dinner. It has smoked Gouda, cubed ham, mashed potatoes, milk, and roasted garlic, which all comes together to make the best one pot meal. Make it fun for your kids by floating shamrock toast points in their bowls. 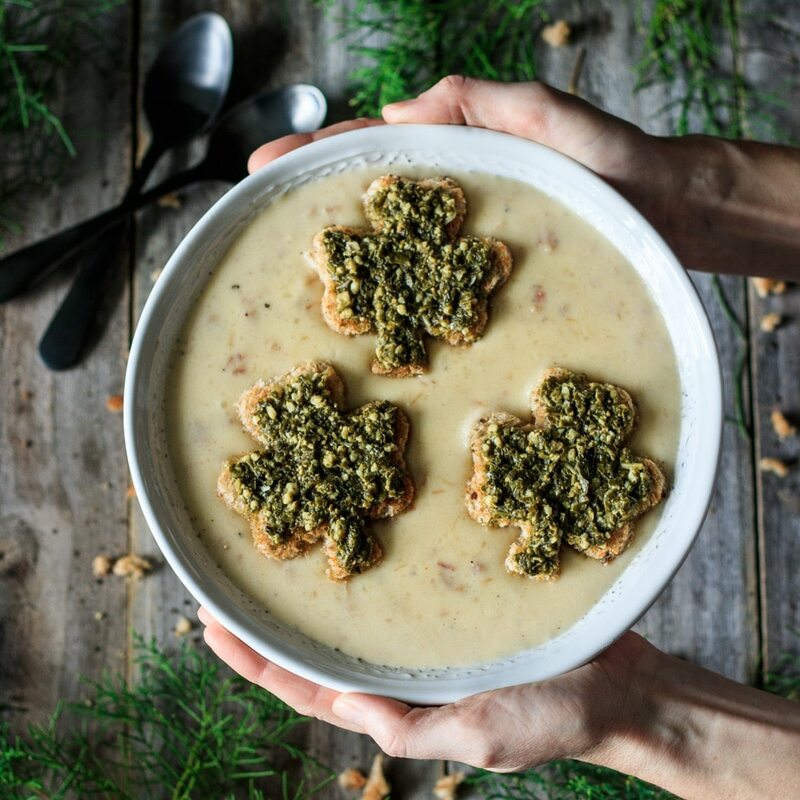 Are you looking for something to serve for St. Patrick’s Day? Why don’t you try this delicious smoky cheese, potato and ham soup? It gets its smoky flavor from the smoked Gouda which is the key ingredient for this soup. The other star is the roasted garlic. Garlic makes so many dishes taste better, and roasting the garlic takes it up a notch. If you’ve never roasted garlic before, it’s so easy to do. Just cut off the top, drizzle on some oil, cover with foil, and wait for it to roast. I’ve added ham to this soup, because I have a house full of ham lovers, plus it increases the protein. But if you want a vegetarian version, feel free to leave it out. Like any good Irish dish, this soup’s got potatoes. 🥔 You can save some time, if you have leftover mashed potatoes in the fridge, but if not, no worries. You can whip up a fresh batch while the garlic is roasting. Make it extra special by garnishing it with shamrock toast points that are spread with pesto. 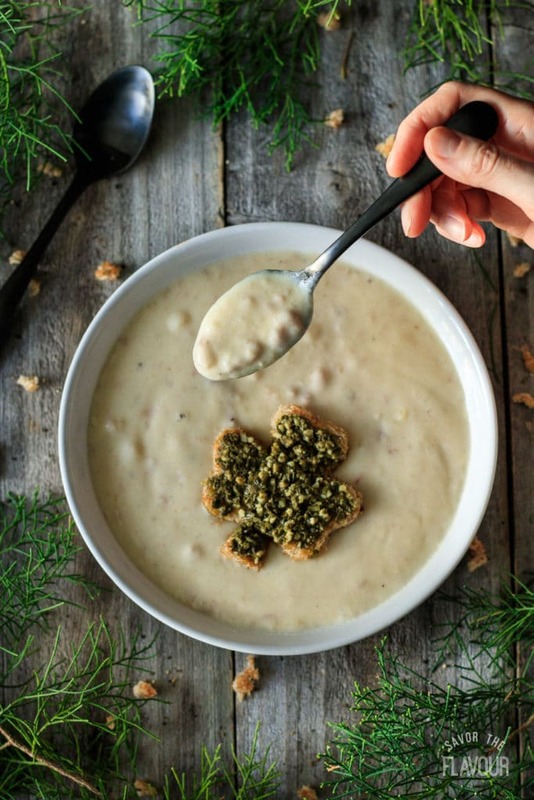 Pair this soup with our Irish soda bread or boxty bread, and serve it for lunch for your hungry guests. It’s bound to get smiles all around. Hungry for more? 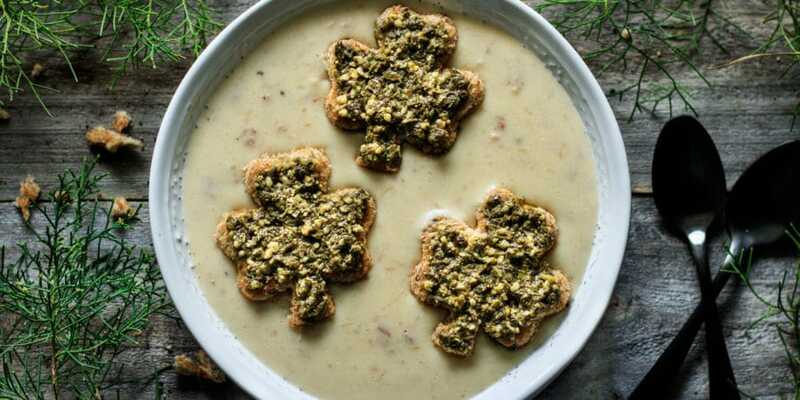 Check out these fantastic Irish recipes that will make your St. Patrick’s celebration a big hit! 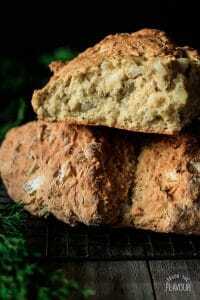 Oregano Onion Soda Bread: a moist, savory loaf of Irish soda bread. No yeast required! How to Make Non Alcoholic Irish Coffee: a quick coffee drink that will perfectly round out a St. Patrick’s Day meal. Smoky cheese, potato, and ham soup is an easy recipe that is made in your Dutch oven. You can proudly serve this St. Patrick’s Day comfort food to your family for lunch or dinner. It has smoked Gouda, cubed ham, mashed potatoes, milk, and roasted garlic, which all comes together to make the best one pot meal. Make it fun for your kids by floating shamrock toast points in their bowls. Cut 1/4 inch off the top of the head of garlic and remove the outer skins, keeping the head intact. Place cut side up in a small ovenproof bowl and drizzle the olive oil on top. Cover the bowl with foil and place on a small cookie sheet or cake pan to make it easier to remove from the oven. Bake for 40 minutes. Once cool, remove the cooked cloves and finely chop them. Peel and finely dice the potatoes, then boil them in a soup pot for about 15 minutes, until fork tender. Drain and mash the potatoes, stir in the chopped garlic, and set aside. Wash and dry the pot. Grate the smoked Gouda and toss it with the two tablespoons of flour. Finely dice the cooked ham. In the soup pot, combine the ham, cayenne pepper, and white pepper. Cook for a couple of minutes over medium heat, stirring occasionally. Pour in the milk and let it heat for about 5 minutes or until it is hot, being careful to not let it boil. Gradually whisk in the mashed potatoes. Cook until the potatoes are heated through and the soup has thickened from the potato starch. Stir in the grated cheese. Cook for a few minutes. Toast 4 slices of bread in a toaster. 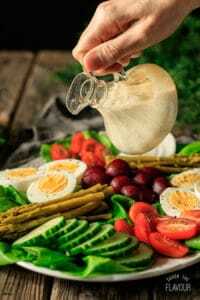 Place the toast on top of a large cutting board. Using a cookie cutter, cut out one shamrock from each slice of bread. Place the leftover bread in a freezer bag to use for breadcrumbs or croutons. Decorating the shamrock toast by spreading the pesto evenly over each shamrock. Try not to go right to the edge, since it looks nice if some of the toast is still visible. Ladle the soup into four bowls. 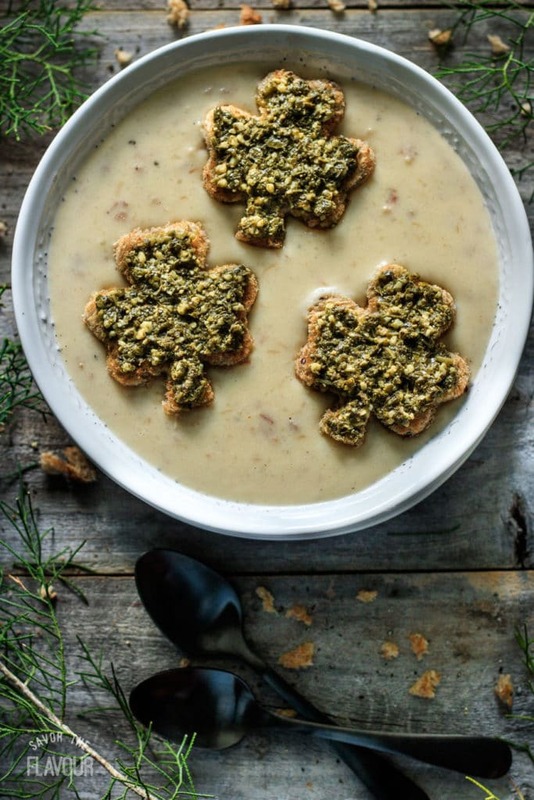 Just before serving, float a shamrock toast on top of each bowl. The shamrock toast points can get soggy if the pesto is spread on top of the toast too soon before serving. If you don’t have a shamrock cookie cutter, make a paper pattern, place it on top of your toast and carefully cut it out with a sharp knife.